One national network and six regional networks devoted solely to the Pac-12! Have a question? Here you can search for answers, review the latest announcements and browse our Frequently Asked Questions about the new networks. How do I get Pac-12 Networks? Does the Pac-12 have a Pac-12 Now app for Apple TV? Providers that support TV Everywhere for Pac-12 Now - Web, iPad, iPhone, Android? ★ How do I get Pac-12 Networks? Can we use Pac-12 highlights on our blog? How do I watch games that aren’t available through my Pac-12 Networks regional channel? ★ Does the Pac-12 have a Pac-12 Now app for Apple TV? ★ Providers that support TV Everywhere for Pac-12 Now - Web, iPad, iPhone, Android? ★ Can I purchase a subscription to watch Pac-12 Networks directly from Pac-12 or Pac-12 Now for online-only viewing? Can I log into Pac-12 Now with my Sling TV username and password? What are the hardware and software requirements for watching video on Pac-12.com? If I don’t know my TV Provider username and password, what should I do? Does Pac-12 Now support closed captioning? My video provider lists multiple Pac-12 alternate channels on their guide, why are they blank? I am Pac-12 alum living in the six-state footprint, but do not have access to my preferred network. How do I get access to the Pac-12 regional network that I want? How do I know which of the seven Pac-12 Networks I have? Why are some channels in standard definition (SD) and others are in high definition (HD)? When will the football games be replayed? What kind of studio shows and other programming does Pac-12 Networks offer? How will you handle programming when multiple Pac-12 games are on at the same time? 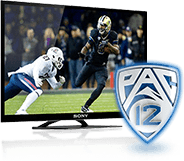 ★ If my TV provider does not carry Pac-12 Networks what are my options? For the countries that are able to receive Pac-12 Networks content on YouTube International, what sports can be seen and how many live events are available for viewing? Can I get Pac-12 Networks in Canada? My son/daughter is a student-athlete at a Pac-12 school and I would like to watch all of their games, but my provider does not carry the appropriate regional network. What should I do? Will Pac-12 Networks be available on the Armed Forces Network (AFN)? Is Pac-12 Networks available internationally?